Hello Grace’s Race Families and Friends! Happy 2019 to all our amazing supporters. Thanks to you, over the last six years Grace’s Race has raised more than $258,000 to support life-saving kids’ cancer research at Children’s Hospital Colorado! It has been quite a year for the Petroff Family! We are so happy to share that Grace is doing wonderfully in her freshman year in the nursing program at Creighton University in Omaha, Nebraska. We’re also excited to announce that Jeff was recently awarded a promotion that will move our family across the country. 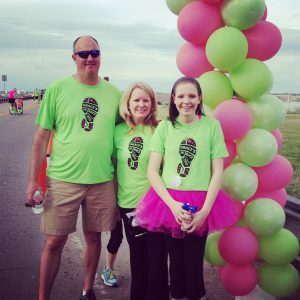 Sadly, this means we will not be in Colorado to participate in the 7th Annual Grace’s Race this year, and for this reason, we’ve asked The Morgan Adams Foundation to transition the event to a new name. The Petri Dash will still take place at Homestead Elementary and the Willow Spring Open Space. This year’s event will be held on Sunday, April 7th, 2019. We TRULY hope all our families and friends will continue to support this wonderful community event to help kids with cancer. Please mark your calendars now – or better yet, go register! – and plan to come out to run this year’s Petri Dash in support of pediatric cancer research! We know first-hand how important research was in Grace’s life, and we will always support The Morgan Adams Foundation’s work to improve the survival rates and quality of life for kids with cancer. Thank you all for your many years of time and effort to help us pay it forward for other kids with cancer and their families. We will be with you in spirit at the Petri Dash on April 7th! Register now!